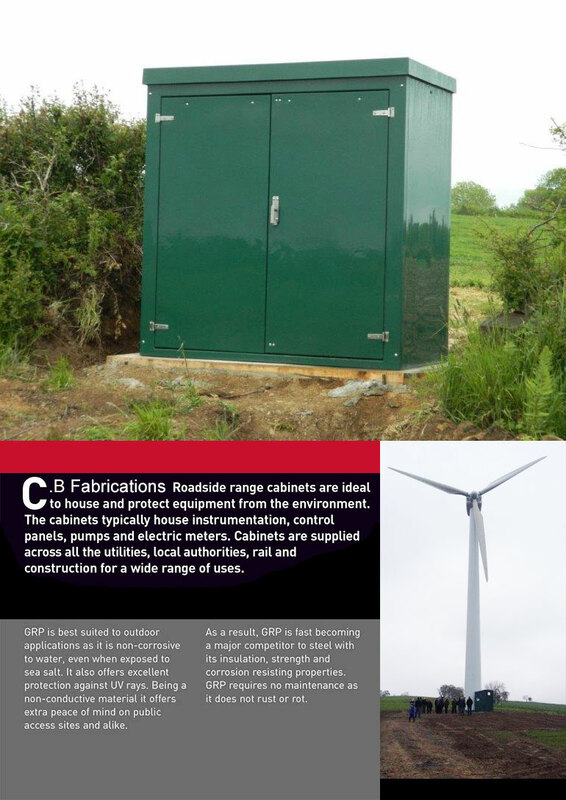 CB Fabrications GRP cabinets, enclosures and housing are suited to both indoor and outdoor applications. Typically they are used by the rail, gas, electrical and water industries for housing control panels, electrical and gas metering, pumps and monitoring equipment. CB Fabrications GRP cabinets, housings and enclosures are non-corrosive to water and salt water. Being non-conductive our cabinets are ideal for electrical installations in public access areas. Our products do not rot or rust and are maintenance free with a long working lifespan. Our range of GRP cabinets are fitted with stainless steel hinges as standard and come with a choice of locks. Hasp and staple, night latch and Yale type cylinder locks. We can fit numerous other locks to suit customer 18mm plywood backboards are fitted to all our GRP cabinets as standard unless otherwise requested. We can reinforce all panels with a 12mm plywood and our GRP cabinets are moulded using self-extinguishing Class 2 fire retardant resin, tested to BS 476:part 7. The doors on our GRP enclosures are reinforced for security and are dust and weather proofed to IP54. Other IP ratings are available upon request. External surface finish is a semi-gloss gelcoat in standard colours of 14-C-39 green and 10-A-07 grey. Internal finish is a white resin flowcoat. Ventilation, cable/generator access flap, internal floor available CR6-CR18. Electrical installation to NICEIC approved. CB Fabrications DD range of GRP cabinets are fitted with stainless steel hinges as standard and come with a choice of locks. Hasp and staple, night latch and Yale type cylinder locks. We can fit numerous other locks to suit customer 18mm plywood backboards are fitted to all our GRP cabinets as standard unless otherwise requested. We can reinforce all panels with a 12mm plywood Our GRP cabinets and enclosures are moulded using self- extinguishing Class 2 fire retardant resin, tested to BS 476:part 7. 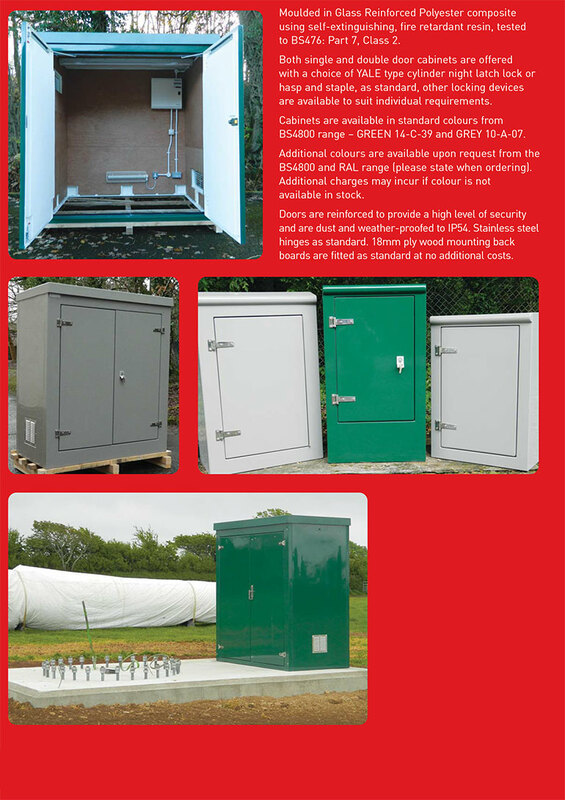 The doors of our GRP roadside cabinets and enclosures are reinforced for security and are dust and weather proofed to IP54. External surface finish is a semi-gloss gelcoat in standard colours of 14-C-39 green and 10-A-07 grey. Internal finish is a white resin flowcoat. Ventilation, cable/generator access flap. Internal floor available CR6-CR18. Electrical installation to NICEIC approved. Our WI range of GRP cabinets are fitted with stainless steel hinges as standard and come with a choice of locks. Hasp and staple, night latch and Yale type cylinder locks. We can fit numerous other locks to suit customer specifications. 18mm plywood backboards are fitted to all our GRP cabinets as standard unless otherwise requested. We can reinforce all panels of the roadside cabinets with a 12mm plywood core for extra security. Our GRP cabinets are moulded using self-extinguishing Class 2 fire retardant resin, tested to BS 476:part 7. Doors are reinforced for security and are dust and weather proofed to IP54. Other IP ratings are available upon request. The external surface finish on all of our roadside GRP cabinets and enclosures are a semi-gloss gelcoat in standard colours of 14-C-39 green and 10-A-07 grey. Internal finish is a white resin flowcoat. Ventilation, cable/generator access flap. Electrical installation to NICEIC approved.